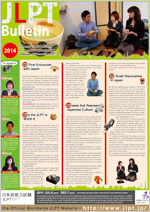 A guide to 2019 JLPT. In Japanese and English. Three JLPT test-takers living in Japan talk about Japanese language, culture and the JLPT. Details of the new test, including comparison with the old test, are explained. The new test is outlined. These slides give an overview of the JLPT. Chacteristics, test sections, scoring sections in the test results and criteria for pass and fail are explained. In addition, each slide comes with a note giving further details.